November 5 — Stand Up for Journalists! Since 2007, each November 5 IFJ's campaign "Stand Up for Journalism" draws attention to the main threats faced by journalists all over the world. In Belarus, this year's main threat is the criminal case launched against prominent journalists and editors of independent media. On August 7-9, the police searched the offices of TUT.BY, BelaPAN news agency and other media outlets, as well as journalists' private apartments. The authorities detained Maryna Zolatava, chief editor of TUT.BY, TUT.BY's editors Hanna Kaltyhina, Halina Ulasik, and Hanna Yarmachonak, BelaPAN's chief editor Iryna Leushyna and its commentator on international affairs Tatsiana Karavenkova, Deutsche Welle's correspondent Pauliuk Bykouski, and editor of Belorusy i Rynok website Aliaksei Zhukau. They all spent several days behind bars. Being suspects in the case, most of them are under travel restrictions. The Investigative Committee suspects journalists of unauthorized access to computer information of BelTA, state-owned news agency. Independent analysts are convinced that BelTA case is an attempt to intimidate and take the leading non-state media under control. The journalists are facing fines and even jail terms. 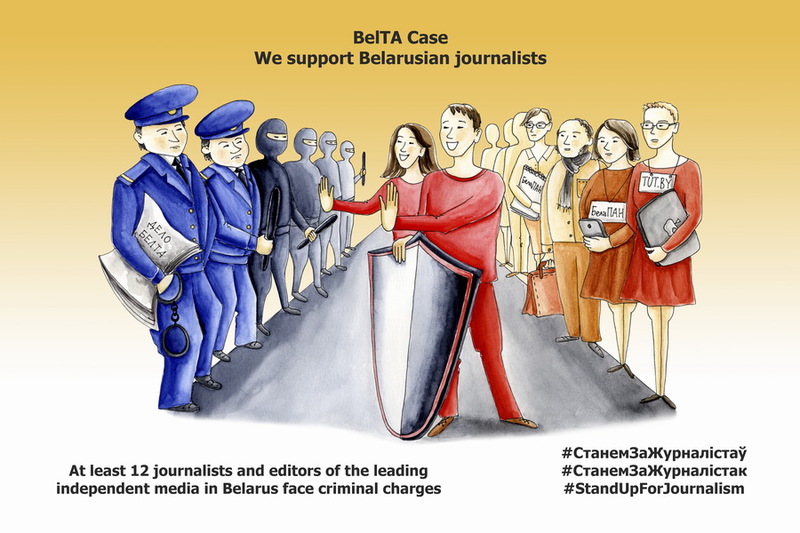 Today we express our solidarity with the journalists and urge the Belarusian authorities to dismiss the criminal proceedings without delay! November 5 - Stand Up for Journalists! Join us in action! Share information and express solidarity on your website and in your social media!